Page 3 - KaBOOM! News | KaBOOM! "The old adage 'the apple doesn’t fall far from the tree' had, for the most part, held a negative connotation for me until the KaBOOM! playground build in Pascagoula in 2008. We didn’t have as many volunteers as the other playground builds I worked on, but there was something different about this project - the kids were pitching in just throwing themselves into any job they could find. Three years before this community was left in total devastation, and now houses that were once uninhabitable were homes again. Many of the people I know, where I used to live in Pascagoula, were too busy mucking out their houses in the days that followed Katrina to worry about when help would arrive. Like community after community along the Gulf Coast they just did what had to be done. Eventually they parked their FEMA trailers next to what was left of their homes, dug in and got busy with rebuilding. What I witnessed in those children the day of the playground build struck me because it mirrored the actions of their parents and community after the storm. At first I just thought the kids would just get in the way, but they were relentless in their determination to help and did not take long to find what they were good at and run with it. It was apparent that it was not just fun to them - this was really hard work but they were determined to complete the project on time. And like their parents and community after Katrina, they didn’t just sit there and wait for the cavalry to show up and do it for them." For most towns a new playground is just that – a great new place to play. But for the people in the Gulf Coast it offered a chance to rebuild their communities. Play it forward so we can keep helping communities recover. "Hurricane Katrina was the most devastating storm to ever hit the United States. The small towns of Waveland and Bay St Louis, Mississippi looked like we had been bombed – it looked like a war zone. My godchild, Ginny Vegas Reynolds, now living in Connecticut, remembered growing up in Bay St. Louis and after Hurricane Camille she and her friends had no place to play. 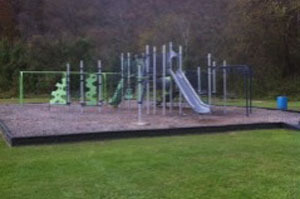 Ginny contacted childhood friends Cheryl Carlson Goodnow in Massachusetts and Joellyn Frisbie Gilmore, my daughter in Diamondhead, a community just north of Bay St. Louis, to coordinate a way to get a playground. In a matter of days Ginny was back in touch. She had made a connection with Darell Hammond, CEO of KaBOOM! The next thing we knew Darell was here to evaluate the situation. Within days a site was selected, KaBOOM! was getting corporate sponsors. Local children became involved with their playground wish lists and a design was developed. The Morkin’s home, which prior to the hurricane had been a bed and breakfast was across the street from the playground site. They immediately opened their home to the staff of KaBOOM! as did the Gilmore’s. They were able to sign up more than 600 volunteers to help build the playground. By mid-December the big trucks rolled in with all the equipment, the design staked off and the build began. It started with breakfast at 7:30 am, then the build was nonstop except for staggered volunteer lunch breaks. It was cold but no one complained. At 3pm the playground was complete. We all stood in wonder!! It was unbelievable! Oh! What a day! Now, 6 years later, it is still beautiful. I pass the playground almost every day. There are always children at play or an adult just sitting on a bench reading a book or just relaxing under an old oak tree. KaBOOM! has been such a blessing to so many children with the additional playgrounds that followed. We love KaBOOM!." After Hurricane Katrina KaBOOM! 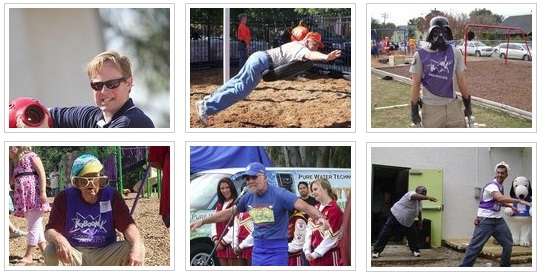 built more than 100 playgrounds on the Gulf Coast. Our work there continues with 3 builds in New Orleans in just the past 3 months. Play it forward with a donation today because in the midst of a disaster kids need play more than ever. "I’ve been fortunate enough to build three KaBOOM! playgrounds with the Junior League of Pittsburgh. Each of the three days brought its own challenges and successes, but as any KaBOOM! build volunteer will tell you, it’s all worth it to see that amazing new playground up at the end of the day. And while three new playgrounds is great, at Easter dinner in 2007 my family and I realized that we could do more. Using my knowledge from the past KaBOOM! builds along with the tools and resources on kaboom.org, my mother, my aunt and myself began planning for a new place to play in our neighborhood. When the project felt like an uphill battle, and it often did, we reminded each other that a playground is essential to the health of our neighborhood; and that our efforts would make an impact on generations of children. We all need play, regardless of our age or socioeconomic status. Play is essential for happiness and growth. The best part of Build Day was the volunteers. Their enthusiasm, excitement and willingness to work was contagious and made for a fun, festive environment. Giving freely of their time and talents for a cause bigger than themselves shaped a sense of pride in our community and in each other. 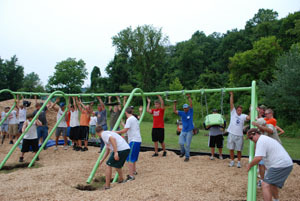 The new playground and the community’s involvement in Build Day sparked an interest in the community to do more. We’re currently planning a Play Day, as well as continuing the fundraising efforts for life-long-sports facilities." Gretchen wouldn’t stop after 1, 2, or even 3 new playgrounds. Since completing the community-built playground project in 2008 she’s gone on to build another playground with KaBOOM! and isn’t planning on stopping anytime soon. Play it forward with a donation today to help support play advocates like Gretchen, and the rest of her family. Help us choose the winners for our Photo Caption Challenge! Over the past week, leading up to yesterday's 2000th build and 15th birthday celebration with First Lady Michelle Obama, we have been reminiscing about our 15 years of building playgrounds by posting photos from our archives to our Facebook page -- and asking YOU to caption them. The one million volunteers who have pitched in their time and sweat to help us build 2,000 playgrounds know that it's a lot of work. Yet, as these photos demonstrate, we don't forget to leave some time for play! Help us choose the winners of our Photo Caption Challenge by hitting the 'Like' button for up to three of your favorite captions per photo. You'll be sure to giggle! Vote by 11:59 p.m. (EST) on Sunday, June 19. Winners receive a KaBOOM! T-shirt or water bottle, and an everlasting sense of triumph. 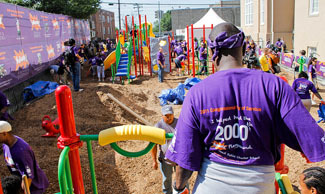 As early as 5:30 this morning, purple-shirted volunteers could be seen congregating at Imagine Southeast Public Charter School in Washington, DC to build our 2000th playground and celebrate our 15th birthday. Imagine Southeast, a tuition-free public charter school, has had no playground equipment at all for its 480 students—but that was all about the change. After a week of extreme heat, we were relieved to find the sun shining not quite-so-fiercely, as hours of mulch-shoveling, concrete-mixing, slide-hoisting, and other physically demanding tasks lay ahead of us. The day officially kicked off with some invigorating warm-up exercises around 8:30 a.m. Among those in attendance were 150 parents and staff from Imagine Southeast, over 85 Boomers (KaBOOM! staff), and AmeriCorps volunteers. We wasted no time getting to work: There were rock walls to assemble; gardens to plant; picnic tables to build; and murals to paint. As afternoon approached, some semblance of a playground was starting to emerge and the mulch pile looked quite a bit less daunting. Still, we knew we could use some extra hands, and luckily, help was on the way. 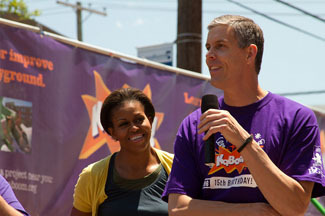 Joining us were some very special volunteers from the White House – members of Congress, who were participating in the 2011 Congressional Day of Service Event; the Honorable Arne Duncan (below left); and First Lady Michelle Obama! Said the First Lady, "You all make sure you help take care of this playground. You make sure that kids get over here and play. We want you all moving." 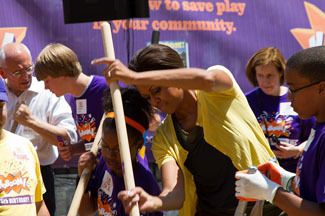 Mrs. Obama is not a playground-building novice -- in June 2009, she joined California First Lady Maria Shriver at Bret Harte Elementary School in San Francisco to transform the school’s vacant play lot into an intergenerational playground and garden. But this time, Mrs. Obama wanted to try her hand at something new. "I’m going to mix concrete!" she announced. "It’s been a lifelong dream of mine to mix concrete." We quickly put the First Lady, the Honorable Duncan, and our Congress members to work, and in just over an hour, the finished playground sparkled under the afternoon sun. As Mrs. Obama prepared to cut the ribbon (above right, with our CEO and Founder Darell Hammond), we hummed “Happy Birthday” to KaBOOM! through hundreds of purple and orange kazoos to close out a thoroughly exhausting, thoroughly rewarding day. Our 2,000th build was funded by the John S. and James L. Knight Foundation, with the participation of our National Partners Dr Pepper Snapple, Foresters, Kraft Foods Foundation, JetBlue, and MetLife Foundation. It represents the collective effort of not just the hundreds of volunteers who were present, but also the one million volunteers who over the past 15 years have contributed their time and sweat to give 5,501,334 children a great place to play. All photos by Chris Sopher, courtesy of the Knight Foundation. As you may know, next week we'll be celebrating our 15th birthday by building our 2000th playground at Imagine Southeast Public Charter School! We're honored that our 2,000th build has also been designated The Congressional Day of Service Event for 2011! How will a playground help transform Imagine Southeast? We've already heard from the students of Imagine Southeast, who shared with us their dream playground designs. And we heard from an Imagine Southeast teacher, Mrs. Shacola Nickens, who emphasized the importance of play in education. But we haven't heard yet from the parents of Imagine Southeast, who are just as excited about the playground as their children! Vickie Moore says, "My son is so looking forward to the playground at ISE. He tells me that for so long when they had outdoor recess they had absolutely nothing to play with. All they did was run and play tag....now he knows he will have a variety of playground equipment to play with." Adds Fran Jackson, "My daughter loves to climb and swing. So I know she will be entertained with the beautiful playground. Having a playground at school will help relieve some of her energy before we go home. I keep reminding myself that all the work is for a good cause and the end result will make the children happy." Learn more about our 2000th build and join us in celebrating 15 years and 2,000 playgrounds by signing our online birthday card! 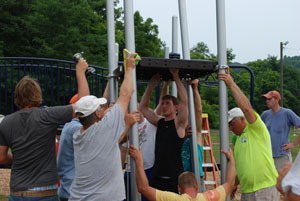 Be sure to like us on Facebook and follow us on Twitter to see the playground build in action on June 15! 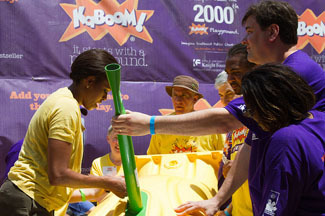 At KaBOOM!, we believe in the importance of play, and we also believe in the power of civic engagement. That’s why we build playgrounds. We actively involve local communities in the planning and building process, inspiring them to engage with and care for their playspaces for years after the concrete sets. On “Make a Difference Day,” this Saturday, October 23, U.S. Secretary of Education Arne Duncan and Corporation for National and Community Service CEO Patrick Corvington will join KaBOOM!, the Knight Foundation, and other White House cabinet members to build a playground, along with the parents, staff and students of Hyde Leadership Public Charter School. This will be the 1,894th build KaBOOM! has led over the past 14 years, and is one of 13 to be built by KaBOOM! and Knight Foundation this year. Planning for the playground began at Design Day, held in August at Hyde-DC, during which students, parents and local community leaders met with organizers from KaBOOM! to design their dream playground. The students’ drawings were then used to create the final playground design. As much as kids love swings and slides, we are excited to complement the community-built play structure with an Imagination Playground™ in a Box. Complete with custom-designed blue foam blocks and elements that encourage sand and water play, Imagination Playground™ in a Box allows children to constantly reconfigure their environment and design their own course of play.